The area allocated to the fair is about 10 acres – more than twice as much space of that used to be occupied in the Great Market-place. Far from the removal of the fair having reduced the number of attractions there are more than ever. All told [the article concluded] Goose Fair at the Forest should prove to be the finest spectacle of its kind which the city has yet seen. Perfect weather, manifestations of the true carnival spirit, plenty of attractions, and an enormous happy-go-lucky crowd were the characteristics of Nottingham’s Goose Fair, which opened today at the Forest. It was the first time the Lord Mayor had performed the opening ceremony, and the first occasion for a very long time that the sounds of revelry came from a source other than the Great Market Place. To those needing it, a sharp reminder that the day of the great fair had arrived came with the display of bills in the tramcars bearing the words “To and from Goose Fair.” The Market-place seemed strangely quiet, and it was difficult to realize that the fair had said “Good-bye” to it forever. The Showmen report good business … [and many of them] admitted that they would have little cause to lament the change of venue. But it all depended on the weather. However, after this initial burst of enthusiasm, questions were still asked about its long-term viability. The fair had moved to the Forest, but was it yet out of the woods? while the first experience on the Forest turned out satisfactory, the change is still in its experimental stage. How many of the thousands who flocked there had gone out of curiosity, just to see the old fair in its new setting? 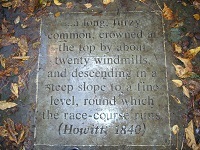 And what will happen in unfavourable weather – not real bad weather, but just showery? Round about the Market-place was plenty of shelter, but the Forest is not only exposed to the elements: it is a long distance from any protection. They needn’t have worried. 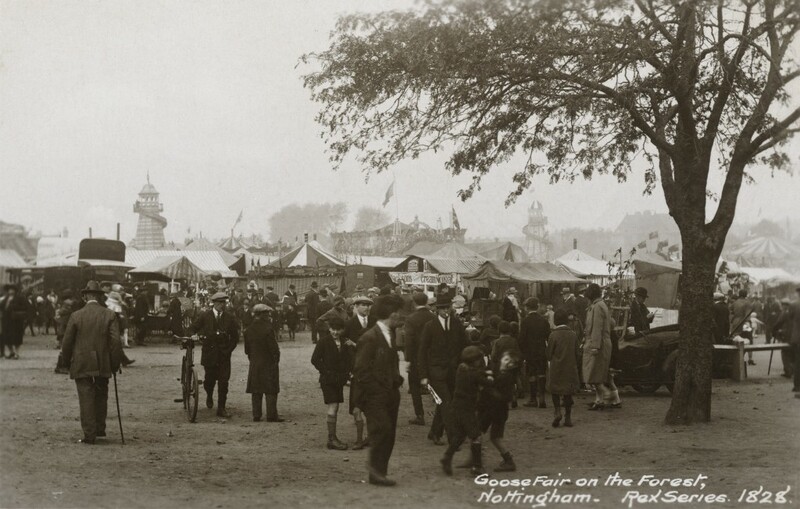 After the fair was over the Nottingham Journal admitted that the bigger space and greater variety of attractions had actually given rise to a record number of fairgoers ‘in spite of the distance of the Forest from the city centre’. While it is impossible to make any precise comparisons in visitor numbers between the last fair in the marketplace in 1927and the numbers who attended in the new location, there is every reason to believe that visitor numbers increased. The area of the new Fair was roughly two and a half times as large, and ‘comfortably full at the time of the opening, while in the evening it was packed.’ In its third year on the new site, in 1930, further record attendances were claimed. The move to the Forest was vindicated. The Goose Fair I saw was the usual agglomeration of roundabouts, shows and stalls, though no doubt some of these had been designed to attract human geese. Any roots this fair had ever had in commerce had withered long ago. It offered the people no opportunities of amusing one another. And the only fairings they could buy there were little plates of peas or winkles, portions of ice cream or packets of brandy snap. It was now simply an assembly of devices, chiefly mechanical, contrived to attract the largest number of pennies in the shortest possible time. You seemed to walk into a square of blazing bedlam. Its narrow avenues were so thickly packed with people that you could only slowly shuffle along, pressed close on every side. In this crushing mass of gaping and sweating humanity were little children, some of them hardly more than babies, who had long ago wearied of all these huge glittering toys, who were worn out by the late hour, the lights, the noise, the crowd, and either tottered along like tiny somnambulists or yawned and whimpered over their parents’ shoulders. The Nottingham Guardian were puzzled (‘What has Nottingham done to Mr J B Priestley?’) while the Nottingham Evening News felt Priestley had given a fair appraisal (‘Mr Priestley’s analysis of the Goose Fair is brilliant – penetrating, devastatingly illuminating’). when it was moved … many people pessimistically thought it would be the end of the fair. The public said we should never see Goose Fair again as we have known it, yet here we are with the fair better and bigger than ever before. Despite the early anxieties that the fair might dwindle or even expire, the Fair has indeed continued to prosper. Innovations continue – although, as ever, not always to everyone’s tastes. For example, the 700th fair was extended from three to four days and since 2009 the fair has been extended to five days.